A German investment bank has seen its shares slump by 35% after revealing unexpected writedowns on the back of its US sub-prime market exposure. 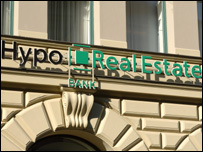 Hypo Real Estate revealed it was writing off 390 million euros ($580m, £294m) on US debt it had bought. Management had repeatedly said that the firm would be unscathed by the credit crunch, which has swept world markets. Investors reacted to the writedown - valued at close to Hypo's entire 2006 net profit - with a massive sell off. Its shares sank to 21.36 euros by the close of Tuesday trading, following the announcement and news that it was slashing its 2007 dividend by two-thirds. Nordinvest analyst Marc Schadeler said that the problem at Hypo - which also has a mortgage lending business - was "credibility and communication". "The crisis has been around for months and Hypo Real Estate has always said: 'We're on the safe side. '", Mr Schadeler said. "That's why the market is disappointed and the stock price is saying it loud and clear." Hypo's chief executive, Georg Funke said that he did not expect further writedowns but could not rule them out. The problems had been impossible to predict, he added, saying the firm's management had done a "fantastic job" and had "not made any mistakes". Firms which bought up parcels of mortgage debt have been hit by the sub-prime crisis after US homeowners started to default on repayments.